For over two decades Elleebana’s name has been recognised in Australia and New Zealand as the industry’s lash specialists. Our experience in lash styling, colouring and shaping has positioned the brand as the national training curriculum’s “Brand of Choice” when offering lash lifting or perming. Over the years we have trained thousands of beauty therapists, hairdressers and we conduct workshops annually with Australia’s leading training institutions, offering support and education in lash artistry. Our excellence in service, innovation with products and leading reputation throughout the industry have all contributed to our success today. It’s with this experience and know-how that our team have released SPM by Elleebana. The SPM by Elleebana is also a complimentary treatment to lash extensions as an enhancement on the lower lash, allowing for additional profitability and repeat valuable business. This is a professional use only in salon treatment. To offer this service in your salon you do need to be trained in the art of application. Our fully qualified team offers the best in the business with over 20 years industry experience & Recognised Australian Training Qualifications. 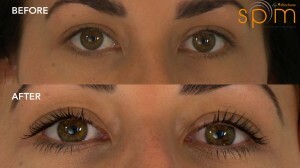 You can view our easy application of SPM with the wonder wands on our videos page here.